In 1989, Matt Groening launched The Simpsons. 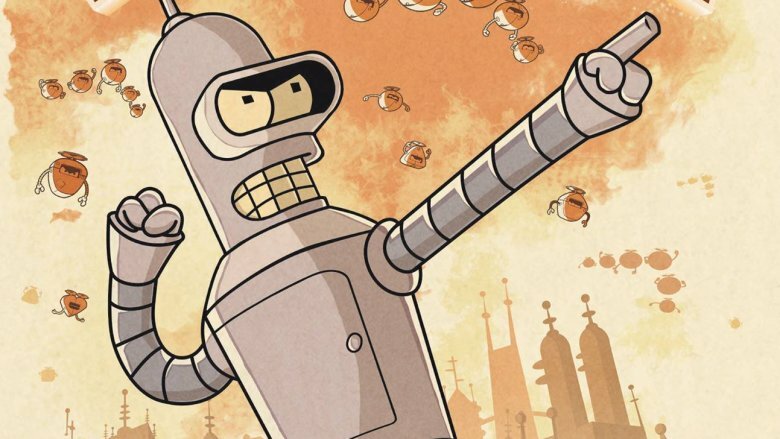 Ten years later, he created another animated comedy classic: Futurama. The series centered around a late-20th-century pizza delivery boy named Philip J. Fry who gets stuck in a cryogenic freezing pod on December 31, 1999, and wakes up in the strange, futuristic world of New New York in the year 3000. Fry meets a surly robot (Bender), a one-eyed mutant (Leela), and his own distant descendant (Professor Hubert J. Farnsworth), a brilliant inventor who also runs a delivery company called Planet Express, the conduit to many comic sci-fi adventures. 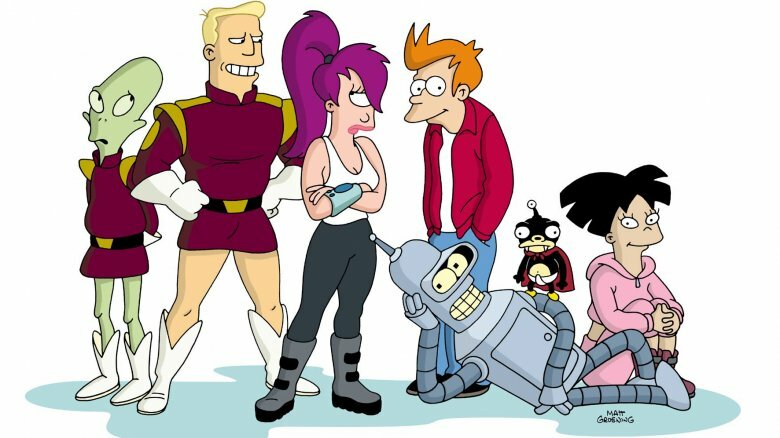 Futurama had a devoted audience that stuck with the show for over a decade through its runs on Fox, Comedy Central, and direct-to-DVD movies. Good news, everyone: Here are some amazing stories you might not have known about Futurama and THE WORLD OF TOMORROW! Futurama was, in retrospect, the perfect title for an ambitious show about the amazing world of tomorrow. Still, creator Matt Groening had some other names that he liked better. On the first season DVD director's commentary, Groening says that his first idea for the show was Aloha, Mars. His other idea was the significantly pessimistic Doomsville. However, it would seem that nobody else working on the show at the time was psyched about those ideas. The title they eventually settled on was lifted from the 1939-1940 New York World's Fair. As visitors were welcomed into "the world of tomorrow!" (a cryogenic facility employee actually says "Welcome to the world of tomorrow!" to Fry in the show's pilot episode), many lined up for the General Motors Pavilion and its major exhibit called "Futurama," which offered a glimpse into the far-off, futuristic year of…1960. On Matt Groening's first show, The Simpsons, several of the main characters were named after Groening's immediate family — for example, Homer and Marge Simpson got their names from Groening's parents. 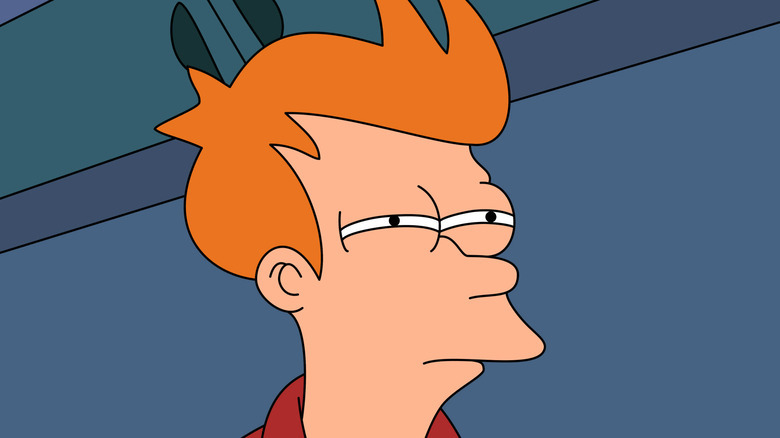 Futurama's lead character, Philip J. Fry, was also named after Groening's father — Philip was his middle name. This means that Homer Philip Groening (who died in 1996) had the unique distinction of lending his name to two major cartoon characters. When production was underway on Futurama in 1998, two of the most important roles were locked down before voice recording began. For Fry, producers picked Charlie Schlatter, a veteran actor (best known for playing the title role in the short-lived TV adaptation of Ferris Bueller) with a slew of voice acting credits in animated shows and video games. For Leela, Nicole Sullivan got the job. At the time, Sullivan was the breakout star of another Fox show, the late-night sketch series Mad TV. But then, according to an IGN interview with voice acting legend Billy West, all of a sudden, producers changed their minds and decided to replace both actors. West, best known at the time for his work on The Howard Stern Show and Ren & Stimpy, had initially lost the role to Schlatter. When the execs pulled their switcheroo, he got the gig after all. For Leela, producers signed actress and singer Katey Sagal, best known for her role as Peg Bundy on Fox's long-running Married…with Children. Bender Bending Rodriguez, the sociopathic, alcohol-fueled bending robot, is probably Futurama's most beloved character. A big part of that is because of John DiMaggio's excellent voice work. The actor discussed his inspiration on The Kevin Pollak Chat Show, and said he took a little bit from cowboy movie actor Slim Pickens (best known among comedy fans for Blazing Saddles), a little bit from drunk barflies, and little bit from a character that a college friend once performed called "Charlie the Sausage Lover." DiMaggio initially auditioned for the role of Professor Farnsworth with that unique, raspy blend of surliness, gregariousness, and self-importance. He didn't get that role, but he got Bender using the same voice. Why not a Zoidberg origin story? 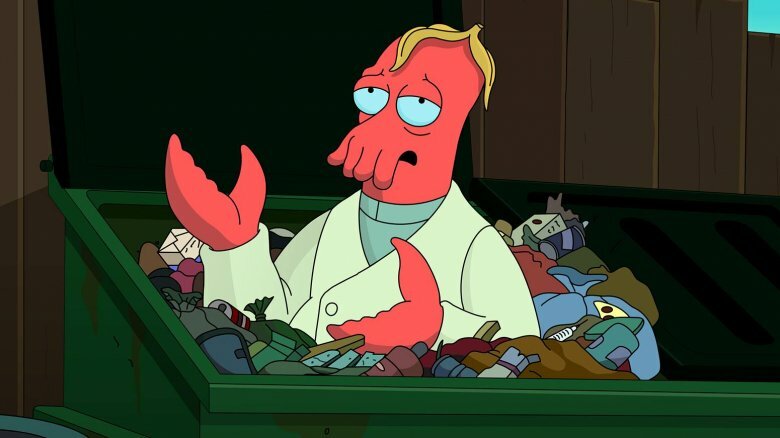 Dr. Zoidberg is a wholly original creation. A man of contradictions, he's lobster-esque but also human-like. He's a doctor, and yet also somehow poor. Best of all, he's a creature of the 31st century from another planet, and talks like an old Vaudeville comedian. Voice actor Billy West pulled from two major old-timey inspirations: actor and host George Jessel, and actor Lou Jacobi. Those inspirations definitely give a Jewish and Yiddish flavor to the character, which West says he thought was appropriate, given the traditionally Jewish "-berg" suffix of the name. That "Zoid," meanwhile, is a futuristic, alien-sounding word that has personal significance for Futurama producer and writer David X. Cohen. "Zoid" comes from Zoid, a computer game Cohen created when he was a kid. He submitted it to Broderbund Software, which not only rejected it, but spelled "Cohen" wrong in the rejection letter — which seems like something that could happen to Dr. Zoidberg. The late, great Phil Hartman specialized in playing characters both obnoxious and oblivious, such as Bill McNeal on NewsRadio. He also voiced sleazy lawyer Lionel Hutz and washed-up actor Troy McClure on Matt Groening's other show, The Simpsons. 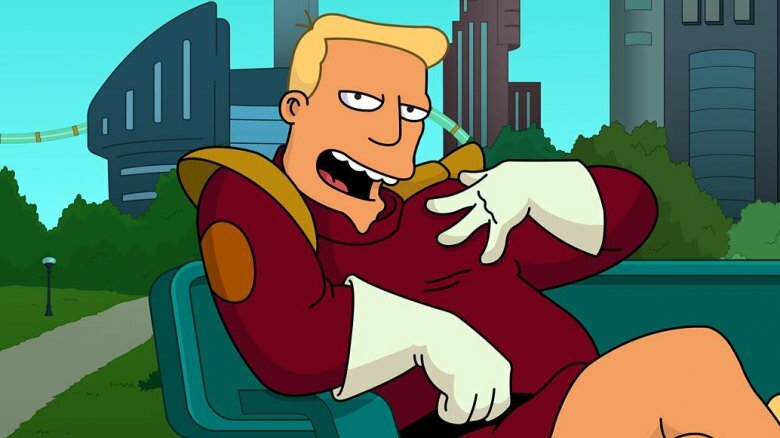 So it makes perfect sense that Hartman had been cast to provide the voice of obnoxious, Captain Kirk-esque spaceship captain Zapp Brannigan on Futurama. But after Hartman's tragic murder in 1998, Billy West stepped into the role. He'd once talked with Hartman over their shared loved of old time radio announcers that had big, booming voices, as well as a huge sense of self-importance. So, West performed Zapp Brannigan in that style as a tribute to Hartman, or at least how he thought Hartman might've done the voice. Futurama's producers really wanted to line up one of the most popular rap groups of the 20th century, the Beastie Boys, to play themselves in the 31st century. Too bad it never actually happened. They'd planned to do it the way many contemporary celebrities guest starred on Futurama: as disembodied heads, kept alive in jars over the centuries. But according to the DVD commentary for the episode "Hell is Other Robots — in which Fry, Bender, and Leela go see the heads of the Beastie Boys in concert — writer/producers Ken Keeler and David X. Cohen went to New York to meet with the Beasties, but never managed to connect. Eventually, the band members were recorded doing their vocals separately. Well, Adam "Ad-Rock" Horovitz and Michael "Mike D" Diamond recorded their tracks; Adam "MCA" Yauch had a scheduling conflict, so Adrock just did his lines for him. Even after all that, the group wasn't entirely happy with the material that Futurama writers had prepared. In the finished episode, the Beasties perform a portion of their 1994 hit "Sabotage" a cappella. They'd initially been asked to do their 1987 hit "(You Gotta) Fight for Your Right (To Party)" in this style, but refused. Nevertheless, there were apparently no hard feelings because the group gave a bit of a shoutout to Futurama on their 2009 single "Too Many Rappers." One of the song's lyrics says that they'll still be in the rap game "until the year 3000 and beyond." In the 2015 Adam Sandler movie Pixels, the government recruits a team of middle-aged guys who were video game champions in the '80s to fight alien attackers who've taken forms from classic video games like Pac-Man and Space Invaders. 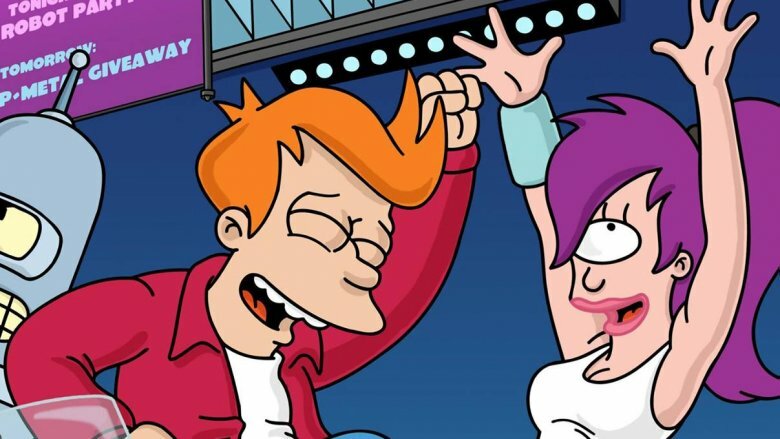 Pixels is a full-length adaptation of a 2010 short called "Pixels," but both films bear a striking resemblance to a Futurama segment that aired way back in 2002. In "Anthology of Interest II," Professor Farnsworth uses his "What-If Machine" to see, at Fry's request, how the world would look if it resembled a video game. In the simulation, treaty talks break down between Earth president Richard Nixon and Ambassador Kong of the planet Nintenduu 64, and war breaks out. Battles evoke games of the 1980s — culminating in rows of aliens attacking Earth, just like in Space Invaders. 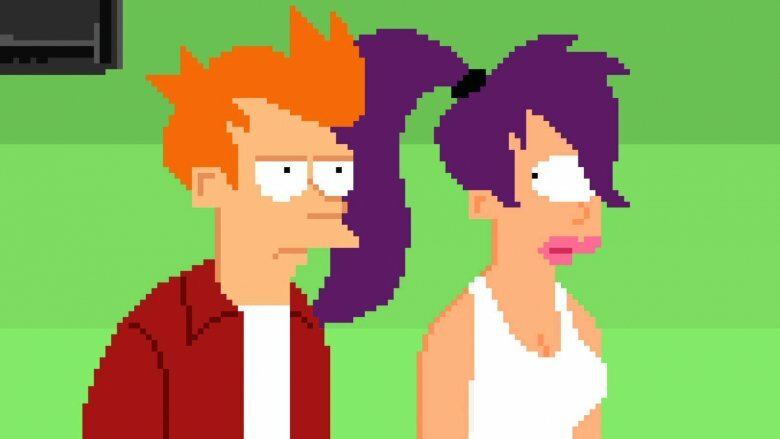 Fry is recruited and saves the planet, as he's the only person on Earth with both the skills and knowledge of '80s video games necessary to handle scenarios out of '80s video games. In other words, it's a pretty similar plot to Pixels. 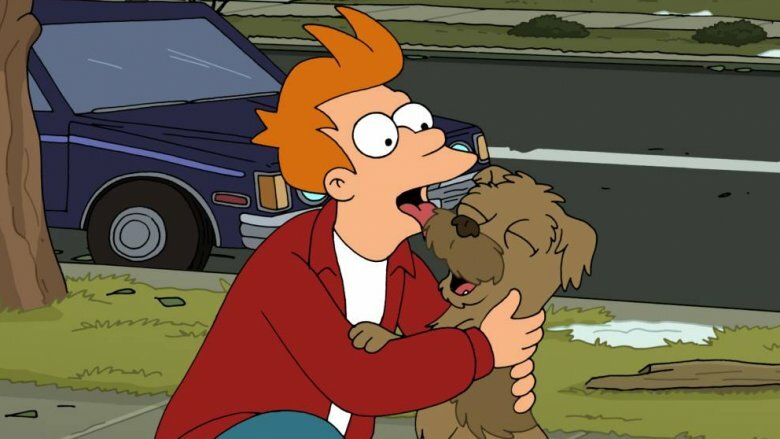 Futurama was always meant to be a comedy, but some episodes would occasionally touch on Fry's sadness and loss at being stuck in the future, having left his life and loved ones behind. The 2002 episode "Jurassic Bark" is one of those episodes. While visiting a museum, Fry discovers the fossilized remains of his 20th century dog, Seymour. Professor Farnsworth tells Fry that he could feasibly take some of Seymour's DNA and create a clone. During the cloning process, Fry learns that Seymour lived to be 15. He figures that after he'd disappeared in 1999, Seymour must have lived a long, happy life without him. And then, the saddest flashback ever flashed across TV screens: Seymour didn't move on — he waited for Fry outside the pizzeria where he used to work for more than a decade. The episode ends with Seymour closing his eyes, passing away, and everyone watching in tears. Amazingly, this episode could have been even sadder. 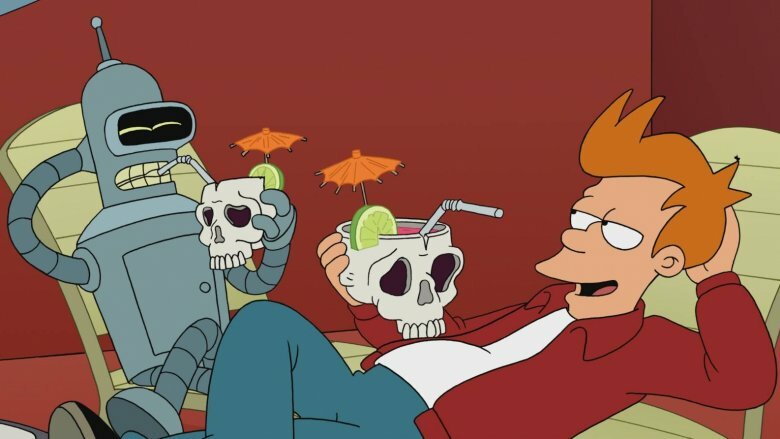 As revealed in the episode's DVD commentary, the writers' toyed around with Fry finding the remains of his mother, and then considering, but ultimately dismissing, cloning her. The show created a new math theorem. The 2010 Futurama episode "The Prisoner of Benda" takes the "body switching" scenario of Freaky Friday to absurd heights. Professor Farnsworth invents a machine that allows him and his intern, Amy, to place each other's minds into one another's bodies. Then the rest of the Planet Express crew gets involved, using the machine to put their brains into each others' bodies to fulfill various whims and goals. However, there's a catch: the machine can't be used twice with the same two people. In order to get everybody's brain back to its original body, the Harlem Globetrotters come to the rescue with a mathematical theorem. In the Futurama universe, the Globetrotters are not only amazing basketball players, but also brilliant scientists and mathematicians. Obviously. Also a brilliant mathematician? The episode's writer, Ken Keeler, who holds a doctorate in math. To find a mathematically accurate way to switch everybody's brain back into the correct body without using the same pair twice, Keeler had to actually devise a brand-new algorithm-based mathematical theorem. Here's the gist: "Let A be a finite set, with more than 1 element; x, y ∉ A. Any permutation π of A can be converted to a trivial (identity) permutation with a sequence of products by transpositions each of which includes just one of x, y." Got all that? No? Well, you probably know how the Globetrotters feel about that.